Home / Film Buzz / The US Box Office Chart: ‘The Boss Baby’ Still On Top! The US Box Office Chart: ‘The Boss Baby’ Still On Top! 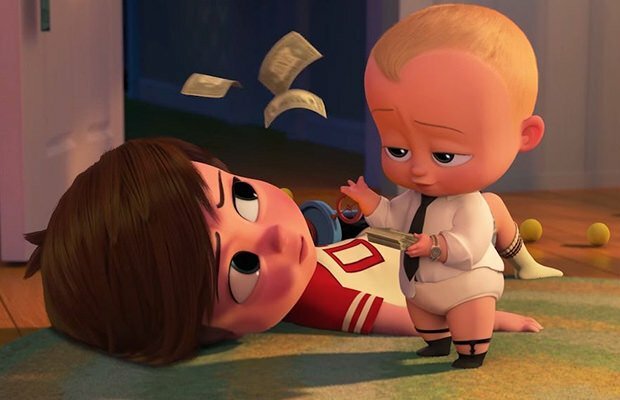 It looks like “The Boss Baby” is indeed the boss! Even the Smurfs going full-animated wasn’t enough to move this adorable animated comedy from the US box office throne. Yes, the suit-wearing briefcase-carrying baby is managing to stay at the top of the domestic box office chart for a second weekend now. The movie added another $26.3 million according to studio estimates, which means “The Boss Baby” grossed up to $89.3 million in the States, while it will soon hit the $200 million mark worldwide. Truly amazing and a tad bit unexpected. Disney continues to dominate the box office with another huge success in the form of their latest animation-to-live-action transformation “Beauty And The Beast”. This rebooted classic snatched $25 million this weekend, despite having been out for four weeks. This means the movie is up to $432 million in the US and is now aiming at the billion-dollar mark globally. “Smurfs: The Lost Village” are in third place grossing $14 million during its opening weekend, which is kind of disappointing if you take into consideration the previous Smurfs opening – the original modern Smurfs took in $35 million on its launch day. “Going In Style”, a bank robbers comedy featuring none other than Hollywood veterans Morgan Freeman and Michael Caine, somehow didn’t get the audience too excited, grossing only $12.5 million. Rounding up the top 5 US box office list is “Ghost In The Shell” with $7.3 million. 10. “The Case For Christ” – $3.9 million.